TLR sense microbial infections, and control activation of immune responses. Dendritic cells, macrophages, and B lymphocytes express TLR and the TLR-signaling adaptor protein MyD88. The impact of TLR-activated B cells on T cell-mediated inflammation is unknown. In this study, we have used mice carrying B cell-restricted deficiencies in MyD88 or in distinct TLR to examine the impact of TLR-activated B cells on a T cell-mediated autoimmune disease, experimental autoimmune encephalomyelitis (EAE). We demonstrate that TLR-signaling in B cells suppresses inflammatory T cell responses (both Th1 and Th17), and stimulates recovery from EAE. Only certain TLR are required on B cells for resolution of EAE, and these are dispensable for disease initiation, indicating that a category of TLR agonists preferentially triggers a suppressive function in B cells and thereby limits autoimmune disease. The TLR agonists controlling the regulatory function of B cells are provided by components of Mycobacterium tuberculosis present in the adjuvant. Thus, MyD88 signaling in B cells antagonizes MyD88 signaling in other cells, which drives differentiation of Th17 cells and is required for induction of EAE. Altogether, our data indicate that B cells link recognition of microbial products via TLR to suppression of a T cell-mediated autoimmune disease. Toll-like receptors function as membrane-bound sentinels that recognize conserved microbial molecules, and link microbial recognition to activation of the TLR-expressing cell (1). Mammals possess at least 12 TLR that provide a powerful system to detect a broad range of pathogens including bacteria (2), mycobacteria (3), viruses (4), fungi (5), and helminths (6). TLR play crucial roles in host defense mechanisms (7). Mice lacking the TLR-signaling adaptor protein MyD88 show impaired survival upon infections with Staphylococcus aureus (8), Salmonella typhimurium (9), Toxoplasma gondii (10), or Mycobacterium tuberculosis (11), as a result of defects in both innate and adaptive immune defense mechanisms. Innate immune mechanisms are critical for early control of infections. Dissection of innate immune mechanisms in Drosophila melanogaster demonstrated that the gene toll, which is the founding member of the TLR family, is absolutely required for activation of antifungal innate immunity (12). TLR have conserved key functions in vertebrates’ innate immune system (13). TLR stimulation increases the phagocytic activity of macrophages and promotes phagosome maturation, allowing efficient capture and destruction of microbes (14). Furthermore, TLR-activated macrophages secrete inflammatory cytokines driving formation of granuloma (15), which limits dissemination of the microbe, and also produce effector substances directly associated with microbe killing (16). Innate immune responses are severely impaired in mice lacking either TLR or MyD88, often leading to a fatal growth of infecting microbes (17, 18). The adaptive immune system, comprised of T and B lymphocytes, provides an important secondary line of defense, which is specific for the infecting microbes and confers long-term immunological protection, in jaw vertebrates. Engagement of TLR can provide the accessory signals needed for activation of effective adaptive immune responses (1, 19, 20). For instance, TLR agonists can be used as adjuvant to induce strong activation of Ag-reactive T cells, while delivery of the same Ag in saline induces tolerance (21). Dendritic cells (DC)4 have a unique capacity to activate naive CD4+ T cells. Following TLR stimulation, they up-regulate costimulatory molecules essential for T cell activation (1), and secrete cytokines releasing primed T cells from the suppressive effect of regulatory T cells (22). As a consequence of their capacity to stimulate both innate and adaptive immunity, TLR agonists can be used to break immunological tolerance and induce autoimmune diseases such as arthritis (23), experimental autoimmune encephalomyelitis (EAE) (24), and diabetes (25). The contribution of TLR signaling to autoimmune diseases is also indicated by the requirement for MyD88 in spontaneous development of systemic lupus erythematosus (SLE) in lupus-prone mice (26, 27). Unexpectedly, TLR stimulation can also suppress autoimmune pathogenesis, indicating a dual role for TLR in autoimmune diseases. For instance, agonists of TLR-4 or TLR-9 can inhibit EAE, arthritis, diabetes, colitis, and SLE in mice (28, 29, 30, 31, 32). Furthermore, TLR appear to naturally limit some autoimmune diseases. Deletion of tlr-9 worsens SLE in lupus-prone mice (33, 34), and polymorphisms in tlr-9 gene leading to lower TLR-9 expression can increase predisposition to SLE in human (35). Thus, TLR agonists may be useful not only to boost immunity against microbes and tumors but also to suppress autoimmune diseases. Understanding how TLR stimulate and dampen immune reactions may thus allow to dissociate their opposite effects and thereby optimize their therapeutic applications. B cells can play an essential role in restraining unwanted autoaggressive T cell responses. In particular, IL-10-producing B cells stimulate resolution of EAE, and suppress disease in collagen-induced arthritis and in a model of chronic intestinal inflammation (36, 37, 38). IL-10-producing B cells have also been identified in humans (39), and preliminary evidence showing that B cells from multiple sclerosis (MS) patients produce decreased amounts of IL-10 suggests that they also play a regulatory role (40). Considering the broad involvement of IL-10-producing B cells in immune homeostasis, it is of interest to understand the factors controlling their suppressive function. In this study, we show that B cells critically depend on TLR and MyD88 to produce IL-10, suppress inflammatory T cells of Th1 and Th17 types, and drive recovery from EAE. Our data identify a new mechanism for the protective roles of TLR in autoimmune diseases. C57BL/6, IL-10−/−, TLR-9−/−, TLR-2/4−/−, MyD88−/−, JHT, μMT, IL-6−/− mice were bred under specific pathogen free conditions at the Bundesinstitut für Risikobewertung, Institute of Immunology and Infection Research (University of Edinburgh, Scotland), and Institut Pasteur (Paris, France). Germ-free C57BL/6 mice were kept in isolators. Bone marrow chimera were made as described previously (41). 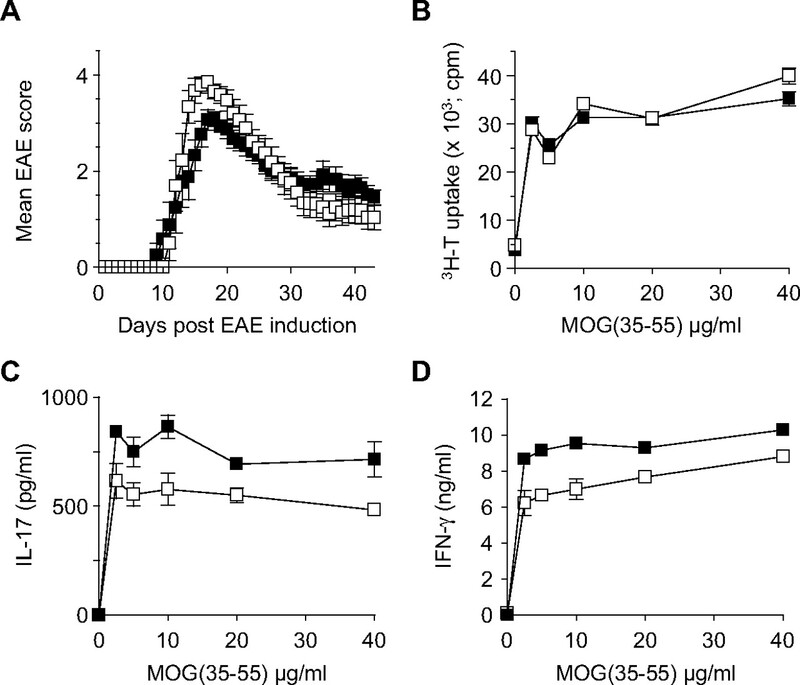 EAE was induced with myelin oligodendrocyte glycoprotein (MOG) (35-55) peptide emulsified in CFA (Sigma-Aldrich) and pertussis toxin (Sigma-Aldrich), and assessed as previously described (36). All experiments were reviewed and approved by appropriate institutional review committee in Germany, France, and U.K.
B cells were obtained by depletion of CD43+ cells using anti-CD43 microbeads (Miltenyi Biotec). Purity was >97% according to CD19 expression. In some experiments, B cells were further positively selected using anti-CD19 microbeads, resulting in B cells that were >99.8% pure, and free of DC. DC were purified from spleens digested with collagenase and DNase (Sigma-Aldrich), and depleted of B cells. DC were isolated from these CD19− cells using anti-CD11c microbeads, resulting in purity >99%. CD4+ T cells were purified from spleens and lymph nodes of C57BL/6 mice using anti-CD4-FITC and anti-CD25-Biotin Abs. CD4+ T cells were positively selected using FITC-Multisort-kit (Miltenyi Biotec), and subsequently released from microbeads according to the manufacturer’s instructions. CD4+ T cells were then separated into CD4+CD25+ T-regulatory cells and CD4+CD25− T cells using anti-biotin microbeads. Purities were routinely >95% for CD4+CD25+, and >98% for CD4+CD25−. LPS was from Escherichia coli serotype 055:B5 (Sigma-Aldrich). CpG oligonucleotide 1826 and its control were obtained from Invivogen. Heat-inactivated Mycobacterium tuberculosis was a gift from Dr. Neyrolles (Institut Pasteur, Paris, France). All Abs and recombinant cytokines were from BD Pharmingen or grown in our facility. B cells, DC, macrophages, or splenocytes were activated at 5 × 105 cells per well in 96-well flat-bottom plates in RPMI 1640 supplemented with 10% FCS, l-glutamine, penicillin, streptomycin, and 2-ME. For analysis of cytokine production by cell-based ELISA, activated cells were transferred together with 150 μl of culture supernatants to a sterile ELISA plate precoated with an anti-cytokine capture Ab. The cells were cultured for a further 24 h before developing the cytokine ELISA with an anti-cytokine detection Ab as previously described (36). IL-10, IL-6, IFN-γ, IL-17, and IL-12 were detected using the capture/detection Ab pairs JES5-2A5/SXC-1, 20F3/32C11, R4-6A2/AN-18, TC11-18H10/TC11-8H4.1, and 9A5/C17.8, respectively. IL-23 and TNF-α were measured using mouse Ready-SET-Go! ELISA kits from eBioscience according to the manufacturer’s instructions. Three × 103 TLR2/4−/− DC were incubated for 2 h in 96-well U-bottom plates in presence of anti-CD3 (clone 145-2C11; 0,1 μg/ml), together with, as indicated, 7.5 × 104 CD4+CD25+ T-regulatory cells, or supernatants from activated B cells or DC, or blocking Abs, or cytokines. In brief, 1.5 × 105 naive CD4+CD25− T cells were then added alone or together with CpG oligonucleotide (1 μg/ml final concentration) as described. After 48 h, [3H]-Thymidine was added and its incorporation measured after 16 h. Supernatants were from B cells or DC activated for 72 h with 2 μg/ml LPS unless otherwise indicated. Sera were diluted and incubated on DNP-BSA coated 96-well plates at 50 μg/ml. Bound Ab was detected using alkaline phosphatase-conjugated anti-IgM and anti-IgG Abs (Southern Biotechnology Associates), followed by addition of PNPP substrate (Sigma-Aldrich). Spleens were harvested, embedded in Tissue-Tek OCT compound (Sakura Finetek), and frozen at −80°C. Five μm-thick cryo-sections were fixed in acetone and dried extensively. Germinal centers were identified by biotinylated PNA (Vector Laboratories), detected with streptavidin-Rhodamine red conjugate (Molecular Probes). B cell follicles were visualized using FITC conjugated goat anti-mouse IgM (Southern Biotechnology). Recovery from EAE requires IL-10 production by B cells, and adoptive transfer of B cells protects recipient mice from disease, demonstrating that B cells can efficiently regulate autoimmunity (36). The signals controlling the suppressive function of B cells are not fully identified. Although effector/memory B cells isolated from mice that have recovered from EAE secreted IL-10 upon activation through BCR and CD40 (36), this stimulation protocol did not induce IL-10 production by B cells taken at an earlier disease stage (36), and naive B cells did not secrete IL-10 upon stimulation via BCR and CD40 (Fig. 1⇓A), implying the need of a different signal. We show in this study that this signal was provided in a MyD88-dependent manner by stimulating TLR-4 or TLR-9 with LPS or CpG oligonucleotides, respectively (Fig. 1⇓, A and B). All B cell subsets (splenic transitional, follicular, and marginal zone B cells, B1 B cells from peritoneal cavity, and lymph node B cells) produced IL-10 upon activation with LPS or CpG (data not shown). In contrast, DC and macrophages from spleen failed to provide significant IL-10 when stimulated under similar conditions (data not shown). Thus, the cytokine environments produced by B cells and DC in response to microbial stimulation differ with respect to the IL-10 content. Microbial products induce IL-10 production by B cells through TLR and MyD88 activation. A, Splenic B cells from C57BL/6 mice were stimulated via BCR (anti-Igκ; clone 187.1; 10 μg/ml), CD40 (anti-CD40; clone FGK-45; 10 μg/ml), or with microbial products, alone or in combinations. LPS was from Escherichia coli serotype 055:B5, Escherichia coli serotype 026:B6, Klebsiella pneumoniae, and Salmonella typhosa. B, Splenic B cells from C57BL/6 (black bars), TLR-2/4−/− (dotted bars), and MyD88−/− mice (white bars) were stimulated with LPS (10 μg/ml), CpG oligonucleotide (10 μg/ml), or its control oligonucleotide (10 μg/ml). B cells were activated for 3 days, and IL-10 production was determined at day 4 by cell-based ELISA. Error bars indicate SEM. The observation that TLR engagement induces IL-10 production by naive B cells suggests a possible role for TLR signaling in the regulatory function of B cells. We therefore tested whether TLR-activated B cells could inhibit T cell responses. For this purpose, we compared culture supernatants from LPS-activated DC and B cells for their influence on T cell activation using an assay in which CD4+CD25− T cells were stimulated with splenic DC and anti-CD3 (Fig. 2⇓). As expected, CD4+CD25+ T cells suppressed T cell stimulation, but this regulation was overcome by addition of CpG (22) (Fig. 2⇓A). In contrast, supernatants from LPS- or CpG-activated B cells inhibited CD4+ T cell proliferation even in presence of CpG (Fig. 2⇓, A and B). The degree of suppression was proportional to the amount and duration of B cell stimulation by LPS or CpG (Fig. 2⇓, B and C). The lack of inhibition with supernatants from IL-10-deficient B cells, or following addition of anti-IL-10 Abs to the T cell culture identified IL-10 as the B cell-derived suppressive factor. Furthermore, this suppression could be mimicked by addition of recombinant IL-10 (Fig. 2⇓D). 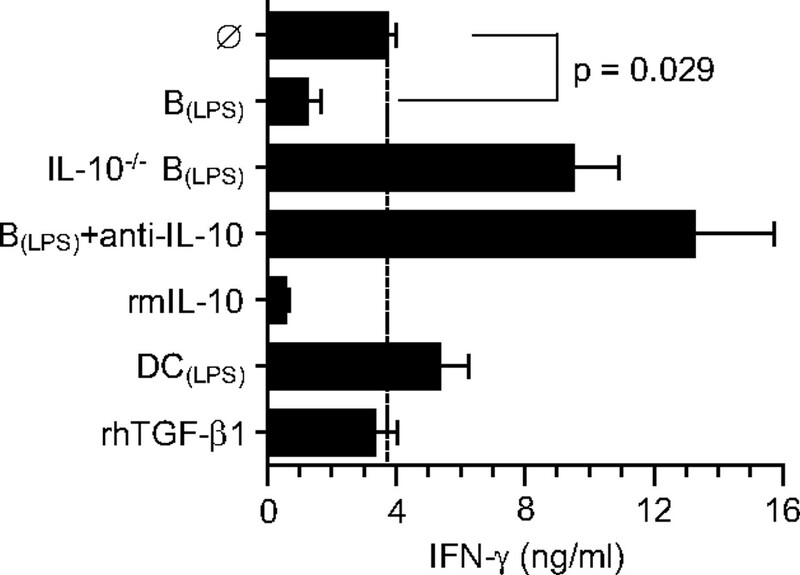 Supernatants from LPS-activated B cells also suppressed production of IFN-γ by CD4+ T cells via a mechanism involving IL-10 (Fig. 3⇓). A similar result was obtained analyzing IFN-γ production by CD4+ T cells in these cultures by intracellular cytokine staining (data not shown). This regulation of T cell proliferation and differentiation was specifically mediated by B cells because supernatants from LPS-stimulated DC enhanced the proliferation of T cells (Fig. 2⇓A) without significantly affecting their production of IFN-γ (Fig. 3⇓). Thus, the function of MyD88 is cell-type specific. Following TLR stimulation, DC and B cells have opposite effects on T cell responses: while DC promote T cell activation, B cells provide a milieu rich in IL-10 that inhibits T cell proliferation and differentiation toward Th1. IL-10 from TLR-activated B cells suppresses T cell activation by DC exposed to microbial products. CD4+CD25− T cell proliferation assays were set-up with splenic TLR-2/4−/− DC and anti-CD3. Proliferation was measured after 48 h by 3[H]-thymidine incorporation. A, Cultures additionally received medium (Ø), or CD4+CD25+ T cells (Tr), or supernatants from DC or B cells activated with LPS indicated by DC(LPS) and B(LPS), respectively. Cultures were done with CpG (black bars) or without (white bars). B, C, and D, All cultures contained CpG. B, Cultures additionally received supernatants from B cells activated for 72 h with increasing doses of LPS or CpG (both in μg/ml). C, Cultures received supernatants from B cells activated with LPS (2 μg/ml) for 1, 2, 3, or 4 days. D, Supernatants from LPS-activated wild-type or IL-10−/− B cells, addition of a blocking anti-IL-10 Ab (JES5-2A5; 20 μg/ml) to the T cell stimulation assay, and recombinant mouse IL-10 (rmIL-10; 20 ng/ml) were used to assess the role of IL-10. Human TGF-β1 was used at 20 ng/ml. Error bars indicate SEM. Statistical analyses were performed using a paired t test. IL-10 from TLR-activated B cells suppresses IFN-γ secretion by T cells stimulated with CpG-stimulated DC. CD4+CD25− T cell assays were set-up with splenic TLR-2/4−/− DC and anti-CD3, as described in Fig. 2⇑. Cultures received medium (Ø), or supernatants from LPS-activated wild-type B cells supplemented or not with blocking anti-IL-10 Ab (JES5-2A5; 20 μg/ml), or supernatants from LPS-activated IL-10−/− B cells, or recombinant mouse IL-10 (20 ng/ml), or supernatants from LPS-activated DC, or recombinant human TGF-β1 (20 ng/ml). CpG was added 2 h later at a final concentration of 1 μg/ml, and supernatants were collected after 48 h to determine IFN-γ concentration by ELISA. Error bars indicate SEM. Statistical analysis was performed using a paired t test. We next examined the role for MyD88 signaling in B cells in vivo using our established bone marrow chimera model to restrict MyD88 deficiency to B cells (41). We first tested whether B cells lacking MyD88 could be activated. Mice in which only B cells lacked MyD88 (B-MyD88−/−) showed no impairment in germinal center formation or DNP-specific IgM and IgG Ab responses following immunization (Fig. 4⇓). MyD88-signaling in B cells is not required for humoral immunity. Chimera in which only B cells lacked MyD88 (B-MyD88−/−; 80% JHT + 20% Myd88−/−→JHT; white bars), and control chimera with wild-type B cells (80% JHT + 20% C57BL/6→JHT; black bars) were immunized via i.p. route with 200 μg DNP-KLH in alum. A, Germinal centers were identified in splenic sections prepared 14 days after immunization by immunofluorescence staining with PNA (red) and anti-IgM (green). Serum levels of DNP-specific IgM (B), and IgG (C) were determined by ELISA after 7, 14, and 21 days. Error bars, SEM. We then used B-MyD88−/− mice to assess whether B cells need MyD88 to promote recovery from EAE induced by immunization with a MOG-derived peptide emulsified in CFA containing inactivated Mycobacterium tuberculosis (36). B-MyD88−/− mice developed a chronic EAE, in contrast to mice with wild-type B cells that recovered from disease (Fig. 5⇓A), demonstrating that the regulatory function of B cells is MyD88-dependent. Because EAE is primarily driven by inflammatory T cells of Th1 and Th17 types (42, 43), we assessed how MyD88-signaling in B cells influences MOG-reactive T cells. Similarly to B cell-deficient mice, B-MyD88−/− mice displayed a stronger self-reactive T cell proliferative response compared with control mice (Fig. 5⇓B), with elevated production of IL-17 (Fig. 5⇓C) and IFN-γ (Fig. 5⇓D). These data demonstrate that MyD88-signaling in B cells suppresses the autoreactive T cell response in vivo, and thus controls resolution of EAE. 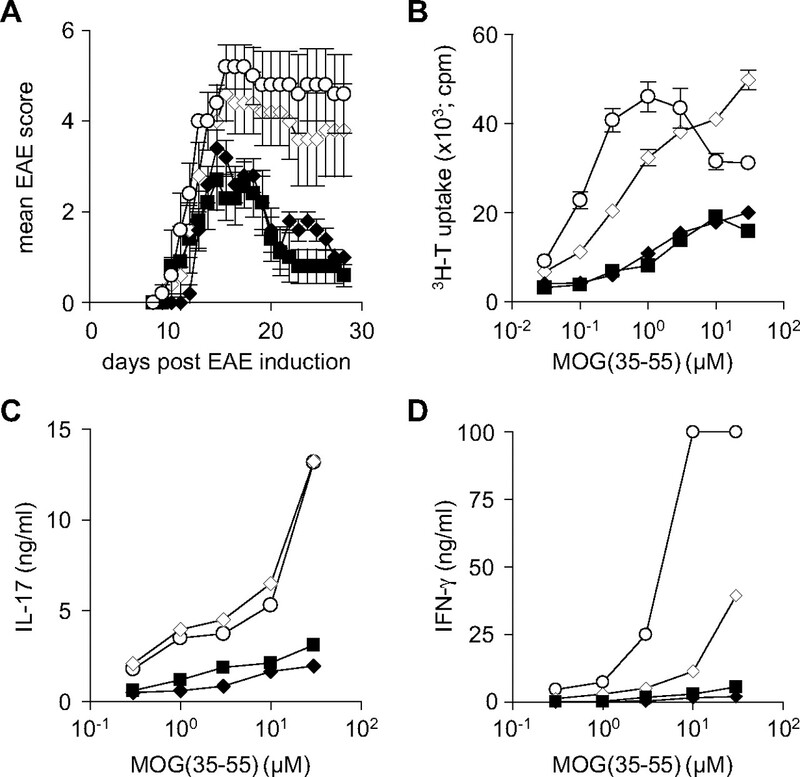 In contrast, MyD88-deficient mice did not develop EAE (44) (Fig. 6⇓A). They showed a weaker Ag-specific T cell response (Fig. 6⇓B), with undetectable quantities of IL-17 (Fig. 6⇓C) and reduced amounts of IFN-γ (Fig. 6⇓D) compared with control mice. The lack of IL-17-producing T cells in these mice seems likely to contribute to their resistance to EAE. MyD88 therefore controls both initiation and termination of EAE. MyD88-signaling in cells other than B cells, presumably DC and macrophages, initiates EAE while MyD88-signaling in B cells drives disease resolution. Recovery from EAE requires MyD88 signaling in B cells. A, Clinical EAE scores (means and SEM) for chimera in which only B cells lacked MyD88 (B-MyD88−/− mice; 80% μMT + 20% MyD88−/−→C57BL/6; ⋄), B cell-deficient chimera (μMT→C57BL/6; ○), and two control chimera groups with MyD88+ B cells (80% C57BL/6 + 20% MyD88−/−→C57BL/6, ♦; and C57BL/6→C57BL/6, ▪). B, C, and D, Splenocytes from mice described in A were harvested 30 days after EAE induction and restimulated with MOG (35-55) for 48 h to assess the MOG-specific proliferation by 3[H]-thymidine incorporation (B), and the production of IL-17 (C) and IFN-γ (D) by cell-based ELISA. Data show representative results from two independent experiments. Each experimental group included six mice. Error bars, SEM. MyD88 signaling controls EAE induction. A, Clinical EAE scores (means and SEM) for MyD88-deficient mice (▿) and C57BL/6 mice (▪). B, C, and D, Splenocytes prepared 30 days after EAE induction were restimulated with MOG (35-55) for 48 h. Proliferation was then determined by 3[H]-thymidine incorporation (B), and productions of IL-17 (C) and IFN-γ (D) were measured by cell-based ELISA. Data show representative results from two independent experiments. Each experimental group included six mice. Error bars, SEM. The observation that MyD88 signaling controls both initiation and resolution of disease prompted us to examine whether identical or different TLR are driving induction and recovery from EAE. To identify the TLR involved in the MyD88-dependent B cell-mediated suppression, we induced EAE in chimeric mice in which only B cells lacked either TLR-9 (B-TLR-9−/−), or both TLR-2 and TLR-4 (B-TLR-2/4−/−). B-TLR-9−/− mice behaved similarly to control mice and recovered normally (Fig. 7⇓A), indicating that TLR-9 is not involved in B cell-mediated regulation of EAE although it contributes to disease severity (44). In contrast, B-TLR-2/4−/− mice developed the chronic form of EAE (Fig. 7⇓A). Compared with controls, splenocytes from B-TLR-2/4−/− and B-MyD88−/− mice produced increased amounts of IL-17 (Fig. 7⇓B) and IFN-γ (Fig. 7⇓C) upon MOG restimulation. Thus, recovery from EAE and limitation of the pathogenic Th1 and Th17 responses require activation of B cells via TLR-2 and/or TLR-4. However, TLR-2/4-double deficient mice, which lack TLR-2 and TLR-4 in all cells, were susceptible to EAE (Table I⇓), indicating that different TLR agonists control induction and resolution of EAE. Thus, it may be possible to either prolong or suppress disease using TLR agonists that preferentially stimulate the innate immune system or trigger a regulatory function in B cells, respectively. How are these distinct TLR agonists provided during EAE? Recovery from EAE requires expression of TLR-2/4 by B lymphocytes. A, Clinical EAE scores (means and SEM) for chimera mice in which only B cells lacked MyD88 (B-MyD88−/− mice; 80% μMT + 20% MyD88−/−→C57BL/6; ⋄), mice in which only B cells lacked TLR-2/4 (B-TLR-2/4−/− mice; 80% μMT + 20% TLR-2/ 4−/−→C57BL/6; white squares), mice in which only B cells lacked TLR-9 (B-TLR-9−/− mice; 80% μMT + TLR-9−/−→C57BL/6; ▴), B cell-deficient chimera (μMT→C57BL/6; ○), and control chimera with wild-type B cells (80% μMT + 20% C57BL/6→C57BL/6; ▪). B and C, Splenocytes from mice described in A were harvested 30 days after EAE induction and restimulated with MOG (35-55) for 48 h to assess MOG-specific production of IL-17 (B) and IFN-γ (C) by cell-based ELISA. Data show representative results from two independent experiments. Each experimental group included six mice. Error bars, SEM. In our model, intestinal microflora and adjuvant components of Mycobacterium tuberculosis are two potential sources of TLR agonists. In a model of intestinal epithelial injury, microflora has been shown to limit tissue damage via a mechanism involving MyD88, TLR-2, and TLR-4 (45). We therefore tested its role in EAE by comparing germ-free mice to mice with a normal flora. Initiation and resolution of EAE were independent of gut flora (Fig. 8⇓A). Furthermore, T cell responses to MOG were similar in both types of mice (Fig. 8⇓, B, C, and D). These data suggest that Mycobacterium tuberculosis components provide both the TLR agonists that induce EAE, and also those that promote disease resolution. Accordingly, B cells stimulated in vitro by nonviable Mycobacterium tuberculosis produced IL-10 in a TLR-2/4- and MyD88-dependent manner (Fig. 9⇓). 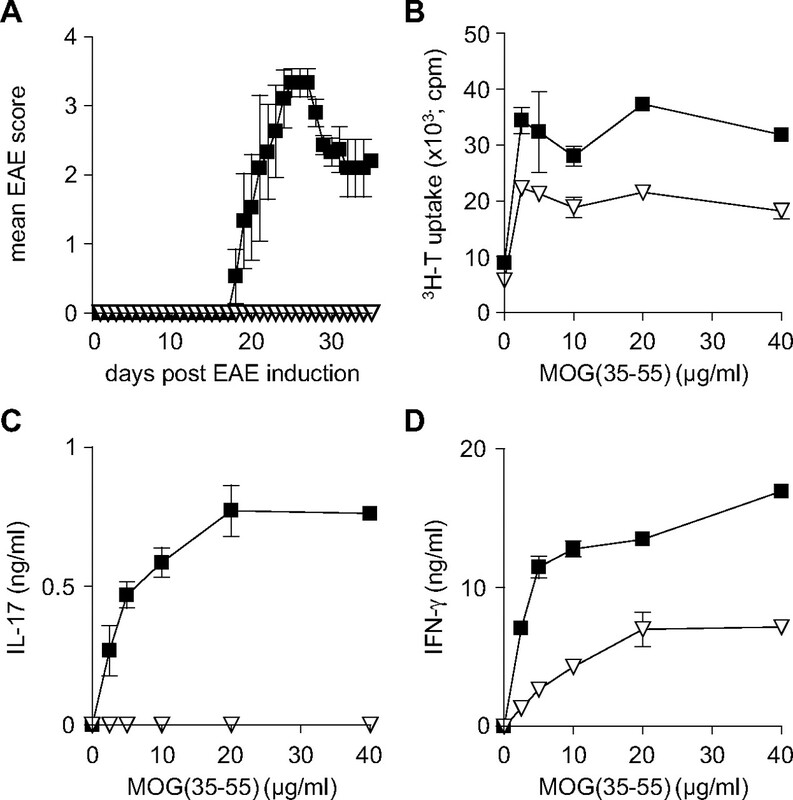 If the suppressive function of B cells is directly controlled by Mycobacterium tuberculosis components of the adjuvant, the B cell-mediated regulation of EAE is likely to start early after immunization. This is consistent with the heightened Th1 responses observed already at day 5 or day 10 after immunization in B cell-deficient mice (46), or in mice with IL-10-deficient B cells (36), respectively. The intestinal microflora does not influence induction and resolution of EAE. A, Clinical EAE scores (means and SEM) for germ-free C57BL/6 mice (□) and specific pathogen free C57BL/6 mice (▪) following immunization with MOG. B, C, and D, Splenocytes from mice described in A were harvested 45 days after EAE induction, and restimulated with MOG (35-55) to assess the MOG-specific T cell proliferative response (B), production of IL-17 (C), and IFN-γ (D). Error bars, SEM. 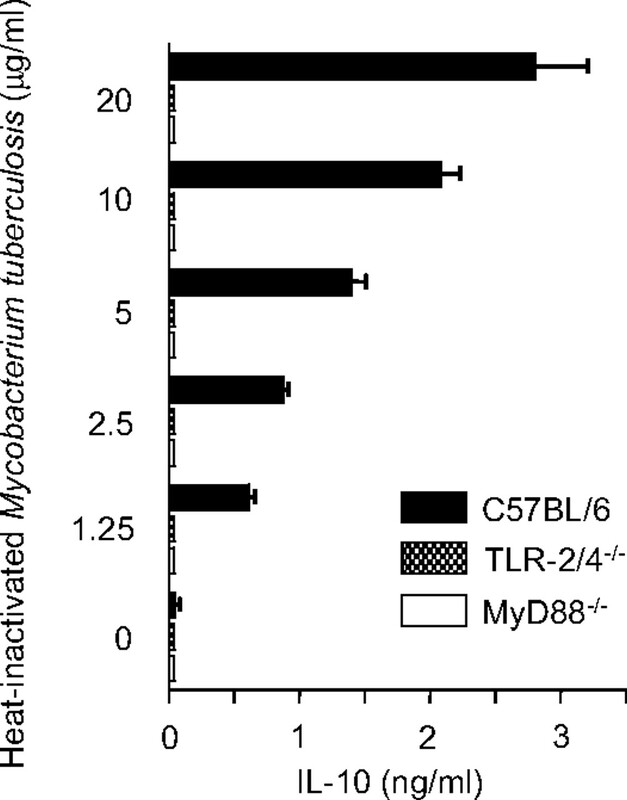 Mycobacterium tuberculosis induces IL-10 production by B cells via TLR-2/4 and MyD88. Splenic B cells from C57BL/6 mice (▪), TLR-2/4−/− mice (▩), and MyD88−/− mice (□) were stimulated with heat-inactivated Mycobacterium tuberculosis for 3 days, and IL-10 was determined at day 4 by cell-based ELISA. Error bars, SEM. We next assessed whether supernatants from TLR-activated B cells modulated T cell responses either by directly targeting T cells or by acting indirectly via DC. Supernatants from LPS-activated B cells did not inhibit CD4+CD25− T cell activation in the absence of DC (Fig. 10⇓A). Recombinant IL-10 also failed to directly suppress T cell activation. In fact, supernatants from both LPS-activated DC and B cells enhanced anti-CD3-mediated T cell proliferation (Fig. 10⇓A), suggesting that, besides IL-10, LPS-activated B cells also produce cytokine(s) that promote T cell growth. Indeed, LPS-activated B cells secrete IL-6 (Fig. 10⇓B), a cytokine that supports T cell growth (47) and stimulates proliferation of anti-CD3-activated CD4+CD25− T cells (Fig. 10⇓C). Remarkably, blocking IL-6 activity with a combination of Abs specific for this cytokine and its receptor was sufficient to almost completely abrogate the stimulating effects of B cell supernatants on T cell proliferation (Fig. 10⇓C). Thus, supernatants from TLR-activated B cells do not suppress T cell proliferation directly in absence of DC. Instead, they can facilitate T cell proliferation via IL-6. 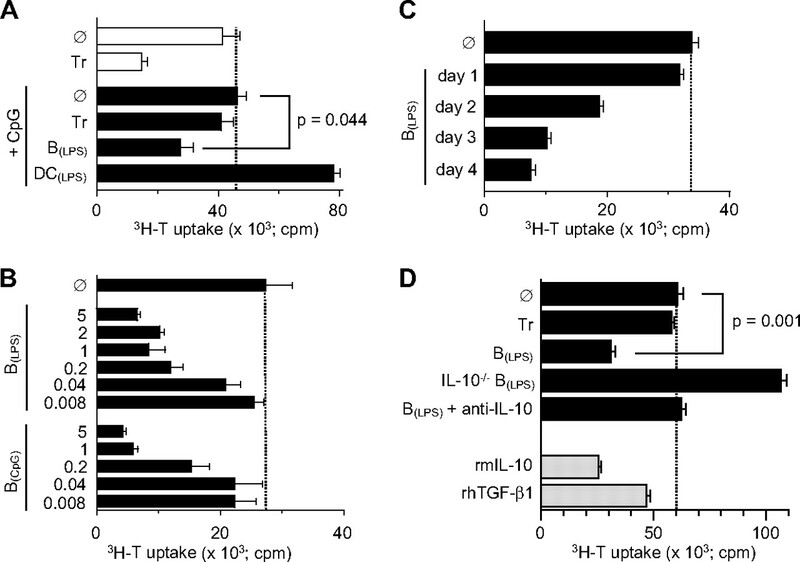 IL-10 from TLR-activated B cells does not suppress T cells directly. A, One × 105 CD4+CD25− T cells were stimulated for 48 h with plate-bound anti-CD3 (1 μg/ml). Some cultures additionally received medium (condition Ø), or LPS, or supernatants from LPS-activated DC or B cells, or IL-10 (20 ng/ml). 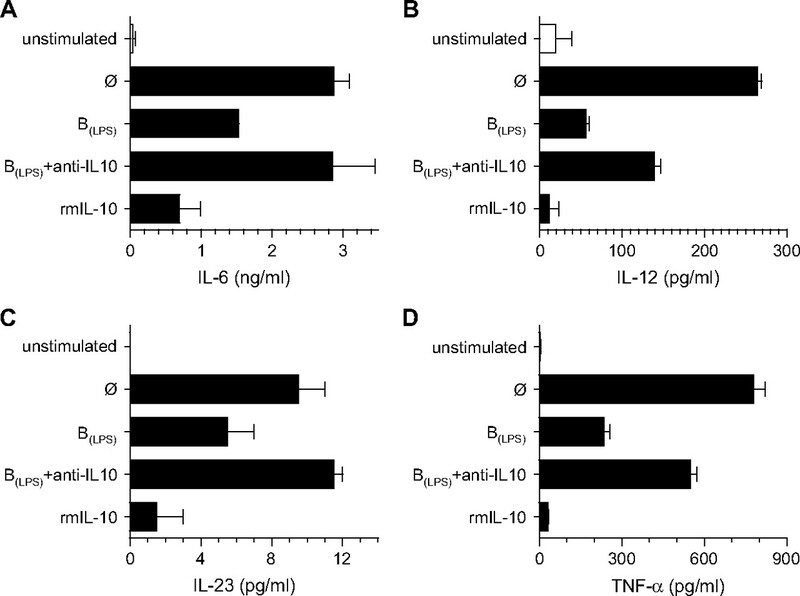 B, IL-6 production by TLR-activated B cells. Splenic B cells from C57BL/6 mice were stimulated for 3 days via BCR (anti-Igκ; clone 187.1; 10 μg/ml), CD40 (anti-CD40; clone FGK-45; 10 μg/ml), or with microbial products. IL-6 production was measured at day 4 by cell-based ELISA. C, One × 105 CD4+CD25− T cells were stimulated for 48 h with plate-bound anti-CD3 (1 μg/ml). Some cultures additionally received medium (Ø), or supernatants from LPS-activated B cells supplemented or not by a combination of blocking Abs against IL-6 (20F3; 20 μg/ml) and IL-6-receptor (D7715A7; 20 μg/ml) (indicated by anti-IL-6), or recombinant mouse IL-6 (20 ng/ml). Proliferation was assessed by 3[H]-thymidine incorporation. Error bars, SEM. These results indicate that the suppression mediated by supernatants from TLR-activated B cells requires presence of DC in the local microenvironment where T cell activation takes place. We therefore assessed whether supernatants from TLR-activated B cells can directly interfere with DC function. Indeed, B cell supernatants inhibited secretion of IL-6, IL-12, IL-23, and TNF-α by CpG-activated DC via mechanisms involving IL-10 (Fig. 11⇓). Thus, TLR-activated B cells generate a cytokine milieu inhibiting provision by CpG-activated DC of factors critical for activation and programming of T cells into Th1 and Th17 cells. The ability of IL-6 to promote CD4+CD25− T cells activation (Fig. 10⇑C), suggested to us that B cell-derived IL-10 could inhibit the T cell proliferation induced by CpG-activated DC by suppressing their production of this cytokine. However, the proliferative response induced by IL-6-deficient DC could be suppressed as efficiently as that one induced by wild-type DC, indicating that inhibition of IL-6 production by DC does not fully explain the suppression mediated by B cell-derived IL-10 (data not shown). 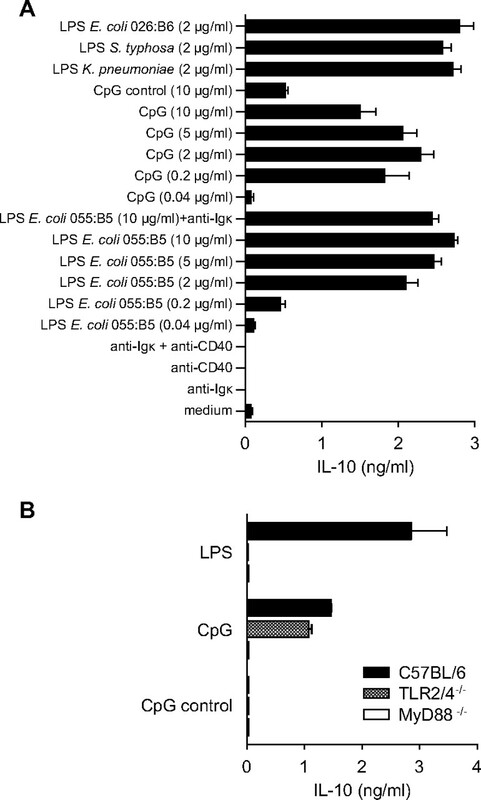 IL-10 from TLR-activated B cells directly suppresses cytokine production by CpG-activated DC. Splenic TLR-2/4−/− DC were incubated for 2 h in medium (conditions unstimulated and Ø), or with supernatants from LPS-activated B cells supplemented or not with a combination of blocking Abs against IL-10 (JES5-2A5; 20 μg/ml) and IL-10 receptor (1B1; 20 μg/ml) (indicated by anti-IL-10), or recombinant mouse IL-10 (rmIL-10; 20 ng/ml). DC were then stimulated with 1 μg/ml CpG (▪) or left unstimulated (□). After 48 h, supernatants were collected to analyze production of IL-6 (A), IL-12 (B), IL-23 (C), and TNF-α (D) by ELISA. Error bars, SEM. Our data demonstrate that TLR-signaling triggers in B cells a regulatory function, which suppresses both Th1 and Th17 cells and converts a chronic T cell-mediated inflammation into a self-limited one. During EAE, the TLR agonists controlling the suppressive activity of B cells are most likely provided by components of Mycobacterium tuberculosis present in adjuvant. Thus, B cells link recognition of microbial molecules to suppression of an autoimmune disease. The roles of TLR in autoimmune pathogenesis are complex because they can either promote or restrain autoimmune diseases. The molecular and cellular mechanisms determining whether a TLR signal either promotes or limits autoimmune diseases are poorly understood. In this study, we show that MyD88 signaling has dual functions in EAE as it controls both initiation and termination of the disease. Using mice carrying B cell-restricted deficiency in TLR and MyD88, we could demonstrate that these opposite TLR-mediated effects are mediated by different cell types. MyD88 signaling in B cells controls disease resolution, while MyD88 signaling in other cells is required for disease induction. The notion that MyD88 function is cell-type specific is further supported by our in vitro experiments with supernatants from TLR-activated DC and B cells. Stimulation of B cells with the TLR agonists LPS or CpG produced a cytokine milieu that could inhibit T cell activation in an IL-10-dependent manner, while activation of DC with LPS produced a milieu that contained very little IL-10 and was able to enhance T cell proliferation. Additional experiments comparing TLR signaling in DC and B cells will be necessary to understand the molecular details of this regulatory circuit. Other APC can convey suppressive signals following TLR stimulation. CD8α+ DC can protect mice from arthritis after CpG administration (29). In addition, following CpG stimulation plasmacytoid DC can differentiate naive T cells into IL-10-producing regulatory T cells (48), and nonplasmacytoid splenic DC can produce the suppressive enzyme IDO (49, 50). However, these mechanisms were insufficient to allow recovery from EAE in the absence of TLR-activated B cells. The B cells controlling recovery from EAE have not been identified yet. Although all B cell subsets can produce IL-10 upon TLR-triggering, it is possible that only a certain B cell subpopulation can regulate autoimmune disease. Indeed, Evans and colleagues have recently shown that transitional type 2-marginal zone precursor B cells have a unique capacity to suppress arthritis via an IL-10-dependent mechanism (51). It will be important to assess the role of this B cell population in EAE. The absence of MyD88 in B cells resulted in both a chronic form of EAE and heightened T cell responses of Th1 and Th17 types, suggesting as a simple model that B cells facilitate disease resolution by suppressing these pathogenic T cells (42, 43). Our data suggest that this could be achieved through B cell-mediated inhibition of DC function. Indeed, TLR-activated B cells inhibited secretion by DC of the Th1- and Th17-promoting cytokines IL-6, IL-12, and IL-23 (52, 53, 54). Furthermore, Moulin and colleagues have previously reported that B cell-deficient mice mount stronger Th1 responses than wild-type mice because of higher secretion of IL-12 by DC (46). A major mediator of B cell suppression is IL-10. Recovery from EAE requires IL-10-producing B cells (36), which limit production of IL-12 by DC and restrain Th1 differentiation (36, 55). In agreement with these findings, we show in this study that TLR-activated B cells limit the capacity of DC to secrete IL-12 and to induce Th1 differentiation in vitro via IL-10. Such modulation of DC function could contribute to regulation of EAE because alteration of the IL-10/IL-12 cytokine balance has been shown to have important effects in this disease (56, 57). The capacity of IL-10 from TLR-activated B cells to suppress secretion of IL-6 and IL-23 by DC suggests that inhibition of Th17 cells is also mediated via modulation of DC by B cell-derived IL-10. However, it is important to keep in mind that TLR-activated B cells can also suppress immunity independently of IL-10. For instance, TLR-activated B cells can directly anergize CD8+ T cells via a cell-contact dependent mechanism involving TGF-β1 (58). They also prevent autoimmune diabetes with a mechanism that possibly involves TGF-β and FasL (59). We have not tested the role of these mechanisms in EAE in this study. B cells may also suppress pathogenic T cells by interacting with regulatory T cells (60), which are also necessary for disease resolution (61). However, our preliminary experiments show no difference in regulatory T cell frequencies in CNS between wild-type and B cell-deficient mice during EAE (data not shown). Yet, B cells could render activated T cells more susceptible to suppression by regulatory T cells through inhibition of IL-6 production by DC (22). TLR-signaling has a unique capacity to initiate IL-10 production in naive B cells, by comparison to BCR and CD40. However, activation via TLR is insufficient to explain the regulatory activity of B cells. For instance, B cells also require activation via CD40 and BCR to allow recovery from EAE (36). Interestingly, B cells first activated with LPS for 3 days, and then restimulated via CD40 in absence of any microbial products produced IL-10 (data not shown). Effector/memory B cells isolated from mice after resolution of EAE also produced IL-10 upon restimulation via BCR and CD40 (36). Altogether, these data suggest a two-step model for the establishment of B cell-mediated regulation. In a first phase, receptors such as TLR initiate IL-10 production by B cells. However, this probably produces too few IL-10 producing B cells for effective regulation of disease. In a second phase, engagement of receptors classically involved in B cell survival and expansion, such as BCR and CD40, amplifies the initial population of IL-10-producing B cells, and thereby allows effective suppression. This second phase may preferentially expand autoantigen-reactive B cells if autoreactive CD4+ T cells are the main source of CD40L. This would establish a feedback loop between pathogenic T cells and B cell-mediated regulation. A similar two-step process seems to be involved in regulation of ulcerative colitis by IL-10-producing B cells (37). In that model, signals delivered via CD1d initiate B cell programming for IL-10 production. B cells also require MHC-II expression and therefore interaction with T cells to suppress UC, but this pathway is mainly needed for amplifying the pool of B cells producing IL-10 as it can be circumvented by increasing the number of MHC-II-deficient B cells available (37). This two-step model predicts that B cells can be activated via CD40 and BCR without acquiring regulatory functions. In keeping with this, we show in this study that B cells lacking the TLR-signaling adaptor MyD88 can form germinal centers and produce Ag-specific Abs. Conversely, one may speculate that chronic infections providing a background level of TLR-stimulation can facilitate acquisition by B cells of suppressive functions protecting against autoimmune diseases, as discussed below. It is notable that other signals can also facilitate IL-10 production by B cells, such as apoptotic cells and some inflammatory mediators (62, 63). Interestingly, distinct TLR have different roles during EAE. We found that mice with B cell-restricted deficiencies in TLR-2 and TLR-4 develop a chronic EAE, while mice carrying TLR-9-deficient B cells recover from disease similarly to mice with wild-type B cells. Consistently, components of Mycobacterium tuberculosis stimulate B cells to produce IL-10 via TLR-2/4 but not through TLR-9 in vitro. Thus, agonists of TLR-2/4, but not of TLR-9, are involved in the regulatory function of B cells during recovery from EAE. The inability of TLR-9 to confer protection is unlikely to be caused by a lack of TLR-9 agonists. Evidence for their availability during EAE is provided by the contribution of TLR-9 to disease severity (44). The selective involvement of TLR-9 in pathogenesis rather than in regulation of EAE may be explainable by the fact that DC and B cells use the same tlr-9 gene to recognize distinct molecules. For instance, type A(D) CpG oligonucleotides strongly stimulate DC and macrophages, but fail to stimulate B cells, while type B(K) CpG oligonucleotides efficiently activate B cells (64). Components of Mycobacterium tuberculosis present in the adjuvant may provide molecules recognizable by TLR-9 expressed on DC and macrophages but not on B cells. In agreement with that notion, although Mycobacterium tuberculosis can stimulate DC and macrophages to produce IL-12p40 via TLR-9 in vitro (65), we found that in B cells it induces IL-10 via TLR-2 and −4 but not TLR-9. Altogether, these findings suggest that B cells and cells of the innate immune system use a different hierarchy of TLR to sense their environment. Similarly, distinct DC subsets express different repertoires of TLR (66, 67). We propose that some microbial molecules preferentially trigger a regulatory function in B cells and limit pathogenesis, while others primarily stimulate the innate immune system and fuel the pathogenic response. Initiation, progression, and resolution of T cell-mediated inflammation are therefore controlled by the balance between these two types of signals. Identification of the mycobacterial molecules involved in induction and resolution of EAE shall allow testing of this hypothesis. Our model predicts that the suppressive activity of a B cell is determined, at least in part, by the TLR agonists it encounters. Our in vitro experiments indicate that TLR-activated B cells can also differently influence immune responses depending on the cellular composition of the microenvironment where they secrete cytokines. It is essential to consider how a TLR agonist impacts on different cells of the immune system to understand its effect on immunity. This has important implications for the treatment of human diseases because CpG and the TLR-7 agonist Isatoribine are entering the clinic to treat patients with metastasized melanoma and chronic hepatitis C infection, respectively (68, 69). We found that B cells producing IL-10 can strongly inhibit the capacity of TLR-agonists to induce a sustained T cell-mediated immune reaction. IL-10-producing B cells have been identified in humans, and they may also have regulatory properties (39, 40). Furthermore, B cells can limit antitumor immunity (70). If CpG and Isatoribine can trigger a regulatory function in human B cells, the therapeutic effects of these TLR-based vaccines may be improved by depleting B cells. Another aspect of our observations relevant to human diseases relates to the mechanisms driving the remission phases from autoimmune diseases. Although it is known that infections can increase risk of exacerbation in relapsing-remitting MS (71), the mechanisms determining remissions are largely unknown. Our observations suggest that both relapses and remissions can be triggered by different components of the same microbe via stimulation of different TLR on distinct cell types. Our finding that some microbial products trigger a regulatory function in B cells provides a link between microbial recognition and suppression of autoimmune disease. Individuals not exposed to infections activating a suppressive program in B cells may have a higher susceptibility to autoimmune pathologies. Similarly, B cells may be poorly suppressive in MS patients who do not experience such “protective” infections. We predict that microbes containing TLR agonists stimulating a regulatory activity in B cells, such as mycobacteria, can protect from autoimmune diseases. About one third of the population worldwide is infected by Mycobacterium tuberculosis (72), and resides mostly in areas of low MS prevalence. An inverse correlation between previous exposure to Mycobacterium tuberculosis and MS incidence has been observed, suggesting that mycobacteria infections can protect from MS (73). Furthermore, a Mycobacterium bovis strain bacillus Calmette-Guérin vaccine has been used to treat MS patients, and resulted in a significant reduction in lesions measured by gadolinium-enhanced magnetic resonance imaging (74). As further support of that notion, EAE can be prevented by prior injection of killed Tubercle bacillus (75, 76) or infection with bacillus Calmette-Guérin (77). Infections stimulating a regulatory function in B cells can also protect from allergic diseases. For instance, the tropical helminth Schistosoma mansoni induces IL-10 production by B cells (78), and thereby protects mice from anaphylaxis (79). Our data provide support for the “hygiene hypothesis”, which relates the sharp increase in incidence of autoimmune disorders (such as MS, type 1 diabetes, or inflammatory bowel disease) in western countries during the last 50 years to the concomitant reduction in incidence of certain infectious diseases (80). We have identified a cell, the B cell, and a receptor, the TLR, which could translate microbial exposure into protection from autoimmune diseases. We thank Dr. Neyrolles for providing the heat-inactivated Mycobacterium tuberculosis, and Dr. Akira for providing the TLR- and MyD88- deficient mice. ↵1 This work was supported by the Deutsche Forschungsgemeinschaft (SFB-650), Medical Research Council U.K., Institut Pasteur, Association pour la Recherche sur la Sclerose en Plaques, and Association pour la Recherche sur le Cancer. Y.H. was funded by Association pour la Recherche sur le Cancer. S.M.A. is a Medical Research Council senior research fellow. ↵2 V.L., K.H., and T.R. contributed equally to this work. ↵4 Abbreviations used in this paper: DC, dendritic cell; SLE, systemic lupus erythematosus; MS, multiple sclerosis; MOG, myelin oligodendrocyte glycoprotein; EAE, experimental autoimmune encephalomyelitis. Means, T. K., S. Wang, E. Lien, A. Yoshimura, D. T. Golenbock, M. J. Fenton. 1999. Human toll-like receptors mediate cellular activation by Mycobacterium tuberculosis. J. Immunol. 163: 3920-3927. Barton, G. M.. 2007. Viral recognition by Toll-like receptors. Semin. Immunol. 19: 33-40. Netea, M. G., G. Ferwerda, C. A. van der Graaf, J. W. Van der Meer, B. J. Kullberg. 2006. Recognition of fungal pathogens by toll-like receptors. Curr. Pharm. Des. 12: 4195-4201. Jenkins, S. J., J. P. Hewitson, S. Ferret-Bernard, A. P. Mountford. 2005. Schistosome larvae stimulate macrophage cytokine production through TLR4-dependent and -independent pathways. Int. Immunol. 17: 1409-1418. Carpenter, S., L. A. O’Neill. 2007. How important are Toll-like receptors for antimicrobial responses?. Cell. Microbiol. 9: 1891-1901. Weiss, D. S., B. Raupach, K. Takeda, S. Akira, A. Zychlinsky. 2004. Toll-like receptors are temporally involved in host defense. J. Immunol. 172: 4463-4469. Scanga, C. A., J. Aliberti, D. Jankovic, F. Tilloy, S. Bennouna, E. Y. Denkers, R. Medzhitov, A. Sher. 2002. 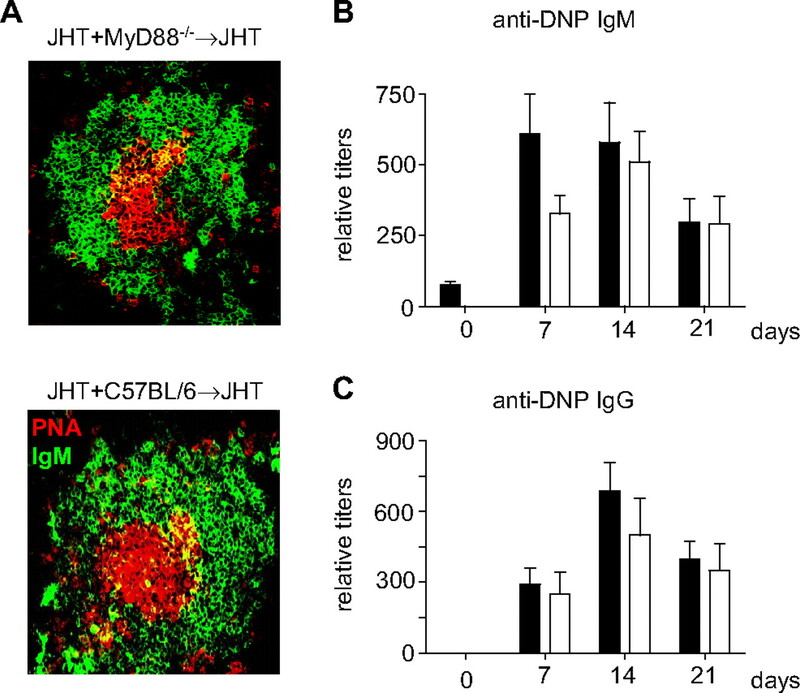 Cutting edge: MyD88 is required for resistance to Toxoplasma gondii infection and regulates parasite-induced IL-12 production by dendritic cells. J. Immunol. 168: 5997-6001. Lemaitre, B., E. Nicolas, L. Michaut, J. M. Reichhart, J. A. Hoffmann. 1996. The dorsoventral regulatory gene cassette spatzle/Toll/cactus controls the potent antifungal response in Drosophila adults. Cell 86: 973-983. Blander, J. M., R. Medzhitov. 2004. Regulation of phagosome maturation by signals from toll-like receptors. Science 304: 1014-1018. Mastroeni, P., J. N. Skepper, C. E. Hormaeche. 1995. Effect of anti-tumor necrosis factor α antibodies on histopathology of primary Salmonella infections. Infect. Immun. 63: 3674-3682. Ulevitch, R. J., P. S. Tobias. 1995. Receptor-dependent mechanisms of cell stimulation by bacterial endotoxin. Annu. Rev. Immunol. 13: 437-457. Seki, E., H. Tsutsui, N. M. Tsuji, N. Hayashi, K. Adachi, H. Nakano, S. Futatsugi-Yumikura, O. Takeuchi, K. Hoshino, S. Akira, et al 2002. Critical roles of myeloid differentiation factor 88-dependent proinflammatory cytokine release in early phase clearance of Listeria monocytogenes in mice. J. Immunol. 169: 3863-3868. Edelson, B. T., E. R. Unanue. 2002. MyD88-dependent but Toll-like receptor 2-independent innate immunity to Listeria: no role for either in macrophage listericidal activity. J. Immunol. 169: 3869-3875. Bretscher, P., M. Cohn. 1970. A theory of self-nonself discrimination. Science 169: 1042-1049. Janeway, C. A., Jr. 1989. Approaching the asymptote? Evolution and revolution in immunology. Cold Spring Harbor Symp. Quant. Biol. 54: 1-13. Deng, G. M., I. M. Nilsson, M. Verdrengh, L. V. Collins, A. Tarkowski. 1999. Intra-articularly localized bacterial DNA containing CpG motifs induces arthritis. Nat. Med. 5: 702-705. Segal, B. M., J. T. Chang, E. M. Shevach. 2000. CpG oligonucleotides are potent adjuvants for the activation of autoreactive encephalitogenic T cells in vivo. J. Immunol. 164: 5683-5688. Lang, K. S., M. Recher, T. Junt, A. A. Navarini, N. L. Harris, S. Freigang, B. Odermatt, C. Conrad, L. M. Ittner, S. Bauer, et al 2005. Toll-like receptor engagement converts T-cell autoreactivity into overt autoimmune disease. Nat. Med. 11: 138-145. Silver, K. L., T. L. Crockford, T. Bouriez-Jones, S. Milling, T. Lambe, R. J. Cornall. 2007. MyD88-dependent autoimmune disease in Lyn-deficient mice. Eur. J. Immunol. 37: 2734-2743. Sadanaga, A., H. Nakashima, M. Akahoshi, K. Masutani, K. Miyake, T. Igawa, N. Sugiyama, H. Niiro, M. Harada. 2007. Protection against autoimmune nephritis in MyD88-deficient MRL/lpr mice. Arthritis Rheum. 56: 1618-1628. Buenafe, A. C., D. N. Bourdette. 2007. Lipopolysaccharide pretreatment modulates the disease course in experimental autoimmune encephalomyelitis. J. Neuroimmunol. 182: 32-40. Wu, H. J., H. Sawaya, B. Binstadt, M. Brickelmaier, A. Blasius, L. Gorelik, U. Mahmood, R. Weissleder, J. Carulli, C. Benoist, D. Mathis. 2007. Inflammatory arthritis can be reined in by CpG-induced DC-NK cell cross talk. J. Exp. Med. 204: 1911-1922. Quintana, F. J., A. Rotem, P. Carmi, I. R. Cohen. 2000. Vaccination with empty plasmid DNA or CpG oligonucleotide inhibits diabetes in nonobese diabetic mice: modulation of spontaneous 60-kDa heat shock protein autoimmunity. J. Immunol. 165: 6148-6155. Rachmilewitz, D., F. Karmeli, K. Takabayashi, T. Hayashi, L. Leider-Trejo, J. Lee, L. M. Leoni, E. Raz. 2002. Immunostimulatory DNA ameliorates experimental and spontaneous murine colitis. Gastroenterology 122: 1428-1441. Gilkeson, G. S., P. Ruiz, A. M. Pippen, A. L. Alexander, J. B. Lefkowith, D. S. Pisetsky. 1996. Modulation of renal disease in autoimmune NZB/NZW mice by immunization with bacterial DNA. J. Exp. Med. 183: 1389-1397. Christensen, S. R., J. Shupe, K. Nickerson, M. Kashgarian, R. A. Flavell, M. J. Shlomchik. 2006. Toll-like receptor 7 and TLR9 dictate autoantibody specificity and have opposing inflammatory and regulatory roles in a murine model of lupus. Immunity 25: 417-428. Wu, X., S. L. Peng. 2006. Toll-like receptor 9 signaling protects against murine lupus. Arthritis Rheum. 54: 336-342. Tao, K., M. Fujii, S. Tsukumo, Y. Maekawa, K. Kishihara, Y. Kimoto, T. Horiuchi, H. Hisaeda, S. Akira, S. Kagami, K. Yasutomo. 2007. Genetic variations of Toll-like receptor 9 predispose to systemic lupus erythematosus in Japanese population. Ann. Rheum. Dis. 66: 905-909. Fillatreau, S., C. H. Sweenie, M. J. McGeachy, D. Gray, S. M. Anderton. 2002. B cells regulate autoimmunity by provision of IL-10. Nat. Immunol. 3: 944-950. Mauri, C., D. Gray, N. Mushtaq, M. Londei. 2003. Prevention of arthritis by interleukin 10-producing B cells. J. Exp. Med. 197: 489-501. Duddy, M. E., A. Alter, A. Bar-Or. 2004. Distinct profiles of human B cell effector cytokines: a role in immune regulation?. J. Immunol. 172: 3422-3427. Duddy, M., M. Niino, F. Adatia, S. Hebert, M. Freedman, H. Atkins, H. J. Kim, A. Bar-Or. 2007. Distinct effector cytokine profiles of memory and naive human B cell subsets and implication in multiple sclerosis. J. Immunol. 178: 6092-6099. Fillatreau, S., D. Gray. 2003. T cell accumulation in B cell follicles is regulated by dendritic cells and is independent of B cell activation. J. Exp. Med. 197: 195-206. Kuchroo, V. K., C. A. Martin, J. M. Greer, S. T. Ju, R. A. Sobel, M. E. Dorf. 1993. Cytokines and adhesion molecules contribute to the ability of myelin proteolipid protein-specific T cell clones to mediate experimental allergic encephalomyelitis. J. Immunol. 151: 4371-4382. Prinz, M., F. Garbe, H. Schmidt, A. Mildner, I. Gutcher, K. Wolter, M. Piesche, R. Schroers, E. Weiss, C. J. Kirschning, et al 2006. Innate immunity mediated by TLR9 modulates pathogenicity in an animal model of multiple sclerosis. J. Clin. Invest. 116: 456-464. Moulin, V., F. Andris, K. Thielemans, C. Maliszewski, J. Urbain, M. Moser. 2000. B lymphocytes regulate dendritic cell (DC) function in vivo: increased interleukin 12 production by DCs from B cell-deficient mice results in T helper cell type 1 deviation. J. Exp. Med. 192: 475-482. Rochman, I., W. E. Paul, S. Z. Ben-Sasson. 2005. IL-6 increases primed cell expansion and survival. J. Immunol. 174: 4761-4767. Ito, T., M. Yang, Y. H. Wang, R. Lande, J. Gregorio, O. A. Perng, X. F. Qin, Y. J. Liu, M. Gilliet. 2007. Plasmacytoid dendritic cells prime IL-10-producing T regulatory cells by inducible costimulator ligand. J. Exp. Med. 204: 105-115. Mellor, A. L., B. Baban, P. R. Chandler, A. Manlapat, D. J. Kahler, D. H. Munn. 2005. Cutting edge: CpG oligonucleotides induce splenic CD19+ dendritic cells to acquire potent indoleamine 2,3-dioxygenase-dependent T cell regulatory functions via IFN type 1 signaling. J. Immunol. 175: 5601-5605. Wingender, G., N. Garbi, B. Schumak, F. Jungerkes, E. Endl, D. von Bubnoff, J. Steitz, J. Striegler, G. Moldenhauer, T. Tuting, et al 2006. Systemic application of CpG-rich DNA suppresses adaptive T cell immunity via induction of IDO. Eur. J. Immunol. 36: 12-20. Evans, J. G., K. A. Chavez-Rueda, A. Eddaoudi, A. Meyer-Bahlburg, D. J. Rawlings, M. R. Ehrenstein, C. Mauri. 2007. Novel suppressive function of transitional 2 B cells in experimental arthritis. J. Immunol. 178: 7868-7878. Korn, T., E. Bettelli, W. Gao, A. Awasthi, A. Jager, T. B. Strom, M. Oukka, V. K. Kuchroo. 2007. IL-21 initiates an alternative pathway to induce proinflammatory T(H)17 cells. Nature 448: 484-487. McGeachy, M. J., K. S. Bak-Jensen, Y. Chen, C. M. Tato, W. Blumenschein, T. McClanahan, D. J. Cua. 2007. TGF-β and IL-6 drive the production of IL-17 and IL-10 by T cells and restrain T(H)-17 cell-mediated pathology. Nat. Immunol. 8: 1390-1397. Skok, J., J. Poudrier, D. Gray. 1999. Dendritic cell-derived IL-12 promotes B cell induction of Th2 differentiation: a feedback regulation of Th1 development. J. Immunol. 163: 4284-4291. Segal, B. M., B. K. Dwyer, E. M. Shevach. 1998. An interleukin (IL)-10/IL-12 immunoregulatory circuit controls susceptibility to autoimmune disease. J. Exp. Med. 187: 537-546. Tuohy, V. K., M. Yu, L. Yin, P. M. Mathisen, J. M. Johnson, J. A. Kawczak. 2000. Modulation of the IL-10/IL-12 cytokine circuit by interferon-β inhibits the development of epitope spreading and disease progression in murine autoimmune encephalomyelitis. J. Neuroimmunol. 111: 55-63. Parekh, V. V., D. V. Prasad, P. P. Banerjee, B. N. Joshi, A. Kumar, G. C. Mishra. 2003. B cells activated by lipopolysaccharide, but not by anti-Ig and anti-CD40 antibody, induce anergy in CD8+ T cells: role of TGF-β1. J. Immunol. 170: 5897-5911. Tian, J., D. Zekzer, L. Hanssen, Y. Lu, A. Olcott, D. L. Kaufman. 2001. Lipopolysaccharide-activated B cells down-regulate Th1 immunity and prevent autoimmune diabetes in nonobese diabetic mice. J. Immunol. 167: 1081-1089. Mann, M. K., K. Maresz, L. P. Shriver, Y. Tan, B. N. Dittel. 2007. B cell regulation of CD4+CD25+ T regulatory cells and IL-10 via B7 is essential for recovery from experimental autoimmune encephalomyelitis. J. Immunol. 178: 3447-3456. McGeachy, M. J., L. A. Stephens, S. M. Anderton. 2005. Natural recovery and protection from autoimmune encephalomyelitis: contribution of CD4+CD25+ regulatory cells within the central nervous system. J. Immunol. 175: 3025-3032. Gray, M., K. Miles, D. Salter, D. Gray, J. Savill. 2007. Apoptotic cells protect mice from autoimmune inflammation by the induction of regulatory B cells. Proc. Natl. Acad. Sci. USA 104: 14080-14085. Matsumura, Y., S. N. Byrne, D. X. Nghiem, Y. Miyahara, S. E. Ullrich. 2006. A role for inflammatory mediators in the induction of immunoregulatory B cells. J. Immunol. 177: 4810-4817. Krieg, A. M.. 2002. CpG motifs in bacterial DNA and their immune effects. Annu. Rev. Immunol. 20: 709-760. Jarrossay, D., G. Napolitani, M. Colonna, F. Sallusto, A. Lanzavecchia. 2001. Specialization and complementarity in microbial molecule recognition by human myeloid and plasmacytoid dendritic cells. Eur. J. Immunol. 31: 3388-3393. Appay, V., C. Jandus, V. Voelter, S. Reynard, S. E. Coupland, D. Rimoldi, D. Lienard, P. Guillaume, A. M. Krieg, J. C. Cerottini, et al 2006. New generation vaccine induces effective melanoma-specific CD8+ T cells in the circulation but not in the tumor site. J. Immunol. 177: 1670-1678. Horsmans, Y., T. Berg, J. P. Desager, T. Mueller, E. Schott, S. P. Fletcher, K. R. Steffy, L. A. Bauman, B. M. Kerr, D. R. Averett. 2005. Isatoribine, an agonist of TLR7, reduces plasma virus concentration in chronic hepatitis C infection. Hepatology 42: 724-731. Qin, Z., G. Richter, T. Schuler, S. Ibe, X. Cao, T. Blankenstein. 1998. B cells inhibit induction of T cell-dependent tumor immunity. Nat. Med. 4: 627-630. Correale, J., M. Fiol, W. Gilmore. 2006. The risk of relapses in multiple sclerosis during systemic infections. Neurology 67: 652-659. Kaufmann, S. H.. 2001. How can immunology contribute to the control of tuberculosis?. Nat. Rev. Immunol. 1: 20-30. Andersen, E., H. Isager, K. Hyllested. 1981. Risk factors in multiple sclerosis: tuberculin reactivity, age at measles infection, tonsillectomy, and appendectomy. Acta Neurol. Scand. 63: 131-135. Ristori, G., M. G. Buzzi, U. Sabatini, E. Giugni, S. Bastianello, F. Viselli, C. Buttinelli, S. Ruggieri, C. Colonnese, C. Pozzilli, M. Salvetti. 1999. Use of Bacille Calmette-Guerin (BCG) in multiple sclerosis. Neurology 53: 1588-1589. Lehmann, D., A. Ben-Nun. 1992. Bacterial agents protect against autoimmune disease: I. Mice pre-exposed to Bordetella pertussis or Mycobacterium tuberculosis are highly refractory to induction of experimental autoimmune encephalomyelitis. J. Autoimmun. 5: 675-690. Sewell, D. L., E. K. Reinke, D. O. Co, L. H. Hogan, R. B. Fritz, M. Sandor, Z. Fabry. 2003. Infection with Mycobacterium bovis BCG diverts traffic of myelin oligodendroglial glycoprotein autoantigen-specific T cells away from the central nervous system and ameliorates experimental autoimmune encephalomyelitis. Clin. Diagn. Lab. Immunol. 10: 564-572. Velupillai, P., D. A. Harn. 1994. Oligosaccharide-specific induction of interleukin 10 production by B220+ cells from schistosome-infected mice: a mechanism for regulation of CD4+ T-cell subsets. Proc. Natl. Acad. Sci. USA 91: 18-22. Mangan, N. E., R. E. Fallon, P. Smith, N. van Rooijen, A. N. McKenzie, P. G. Fallon. 2004. Helminth infection protects mice from anaphylaxis via IL-10-producing B cells. J. Immunol. 173: 6346-6356. Bach, J. F.. 2002. The effect of infections on susceptibility to autoimmune and allergic diseases. N. Engl. J. Med. 347: 911-920.